Our stories, videos, and features embrace complex issues around our science, technologies, and mission that provide a context for our historical approach, current problem solving and our vision for the future. 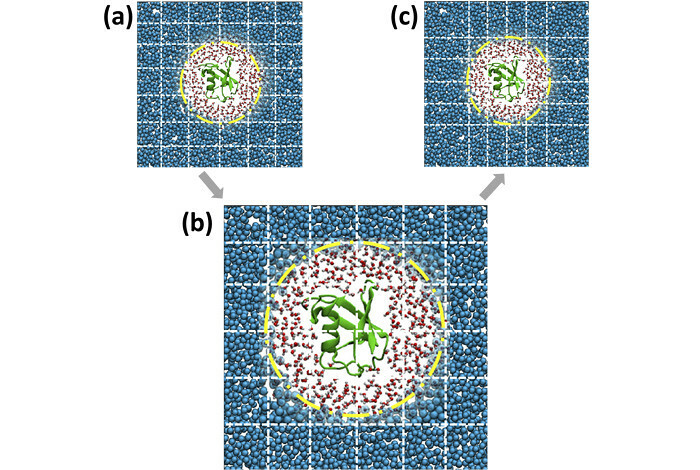 Adaptive resolution situation (AdResS) simulation of an atomistic protein, its atomistic hydration shells and CG water particles. The dashed lines illustrate the spatial domain decomposition. When going from (a) to (c), the effects for load imbalance get mitigated.